We have the ideal security solutions to help you obtain the "Peace of Mind" you want to achieve for your small business. The DSC Power Series allows us to offer you a powerful security solution at an economical price point. We have the complete Power Series line: Power432, Power632, Power832 & Power834. 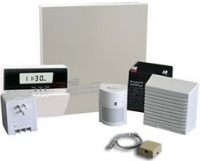 We can setup your system to sound a deafening horn, dial a pager, call your sell or communicate the status alarm to a central monitoring station. This brochure shows you how easily we can give your business "Peace of Mind". 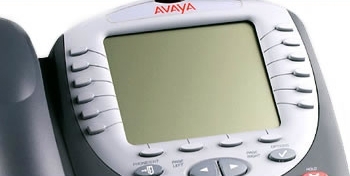 To meet the demands of any application, a variety of keypads are available for the Power Series panels, everything from simple LED keypads to programmable LCD keypads with integrated wireless receivers. With standard features like 5 one-touch function keys, they are all easy to use. The Bravo series is not only an exceptional motion detector, it also provides excellent false alarm immunity in the harshest environments. With its twin, dual-element PIR detectors, unique lens and advanced digital signal analysis, it provides accurate detection while ignoring common false alarm situations, including pets. It comes in wall-mount and ceiling mount configurations. The Bravo will exceed your expectations for stability and performance. 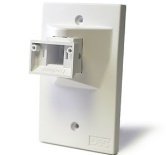 We also carry the perfect mounting bracket for your motion detector. No matter the angle or unique configuration of the room or space, we have the prefect way to optimize your detector's performance. Latched panic buttons are a necessity for financial entities, convenience stores & other business were robbery is a possibility. Once pressed the panic buttons quickly notify your monitoring site that a robbery is in progress and that police assistance is needed immediately. Magnetic door locks allow you to protect your business and special areas. The incredible holding force of the maglock makes sure no one gets in your secure areas without a correct entry code.